Daisy and Faith are littermate sisters. 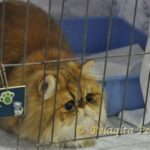 Triple Crown Cat Fanciers - July 8 & 9, 2017, in Lexington, Kentucky. 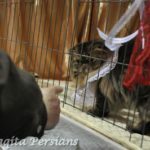 We had the greatest time at this show! 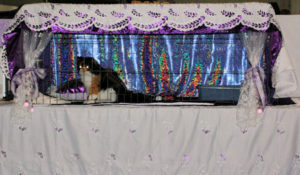 We brought Mikey out for his very first show at four months of age. I was so very proud of him despite the fact he hasn't quite grown in to his ears yet. So... we had Chanan take his first professional pictures. 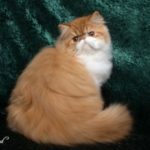 At this show, CFA Judge Anne Mathis honored Mikey with 2nd Best of Breed (Calico and Bi-color class) against five other kittens (including Faith and Daisy). Photo Credit: Chanan - © all rights reserved. 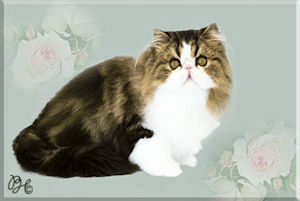 Daisy made his final (8th Best Kitten). 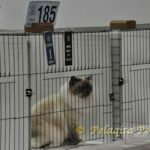 Faith made her final (10th Best Kitten). It was an incredible event. 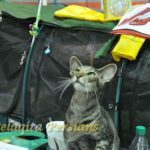 Thank you for all the contributions (including people's time) made by so very many people and the Great Lakes Regions cat clubs, exhibitors, and vendors. My husband and I thoroughly enjoyed ourselves. Thank you to the judges and others for appreciating my girls. 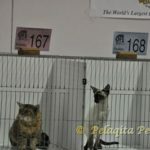 Both kittens made her final with Daisy receiving (9th Best Kitten) and Faith (4th Best Kitten). Thank you. 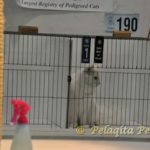 Faith made her final and received 10th Best Kitten. Thank you. 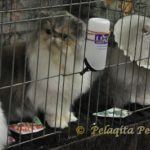 Faith made her final and received 6th Best Kitten and Daisy received 7th Best Kitten. Thank you. Daisy made her final and received 8th Best Kitten and Faith received 4th Best Kitten. Thank you. 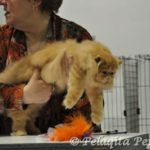 Enjoy the pictures of the cats, judges, exhibitors. 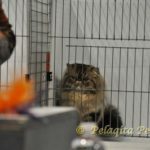 A cat waiting to be judged. 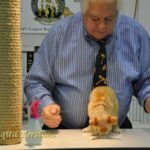 Judge Gene Darrah evaluating an Exotic cat. 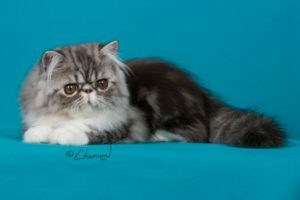 A Persian cat in benching area. 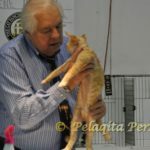 A cat being evaluated at a CFA cat show by Judge Gene Darrah. 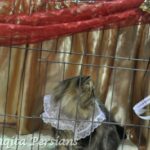 Two cats waiting to see who receives the higher ribbon! 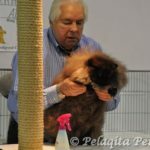 Judge Gene Darrah with black Persian cat. 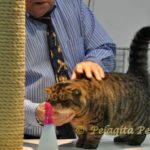 June 14 & 15, 2015 at the Great Lakes Regional Cat show in Wilmington, Ohio, Bishop became a champion. 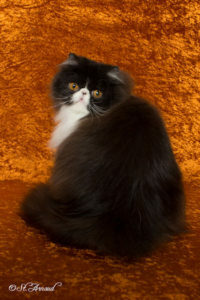 He also was Best of Color/Breed in the Black and White color class against competition under under two judges. CFA champion title pending confirmation. 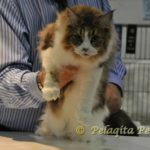 On June 14 & 15, 2015 at the Great Lakes Regional Cat show in Wilmington, Ohio, Emma became a champion. 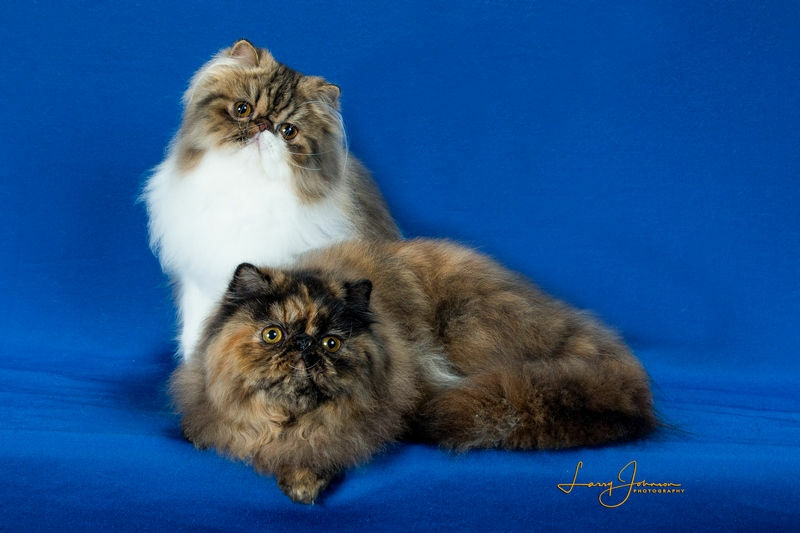 On June 14 & 15, 2015 at the Great Lakes Regional Cat show in Wilmington, Ohio, J.R. became a champion. 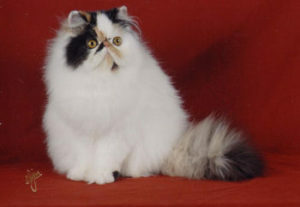 On December 7, 2013, at the Ohio State Persian Club's annual show, Holly became a CFA champion. 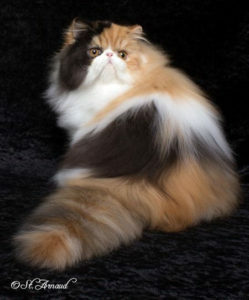 Holly made two finals, where she was awarded "Best Long Haired Champion" which earned her 13 points towards her Grand Champion title under Donna Jean Thompson. 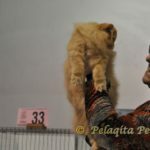 Additionally, Holly was awarded "2nd Best Champion" and earned 24 points towards her Grand Champion title under Judge Gene Darrah. 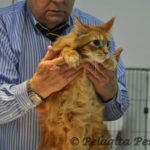 (total 37 points out of the 200 points needed). Thank you Judge Gene Darrah and Judge Donna Jean Thompson. On September 28, 2013, Millie became a Champion. 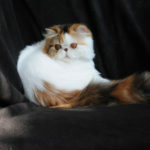 May 31, 2011 - We were just notified that our Grand Champion, Dignity, has been honored with being awarded the Regional Best of Color in the Persian calico and bi-color class for the 2010-2011 show session for the CFA Great Lakes Region. Thank you to all the CFA Judges that recognized Dignity. We are so pleased and proud of this achievement. 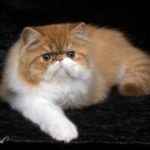 A big shout out to his breeders, Janet and Carissa of Cacao Persians for allowing us the opportunity to own such a wonderful Persian. 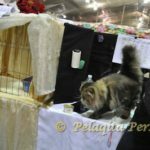 At the Sacred Cat of Burma Fanciers' show on August 28 & 29, 2010, Lucy attained the necessary points/ribbons to receive her CFA championship. 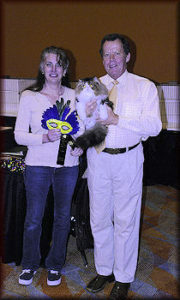 At the Sternwheel Cat Fanciers' show on July 3, 2010, Tempest attained the necessary points/ribbons to receive her CFA championship. 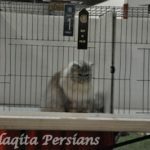 At the Mid-Ohio State Persian Club show on April 3, 2010, Sophia attained the necessary points/ribbons to receive her CFA championship. 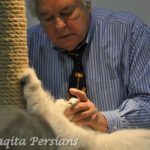 At the Ohio State Persian Club show on February 6, 2010, Cary attained the necessary points/ribbons to receive his CFA championship. 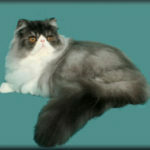 At the Sternwheel Cat Fanciers July 5, 2008 cat show, Herman was awarded the following and attained his CFA Champion title! 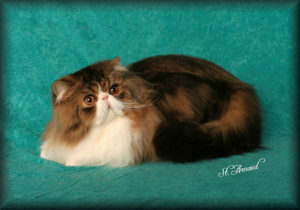 Herman was our first cat born with our cattery name to be shown and titled. 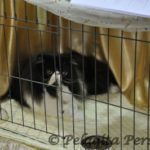 At the Sternwheel Cat Fanciers July 5, 2008 cat show, Hot Rod was awarded the following and attained his CFA Champion title! 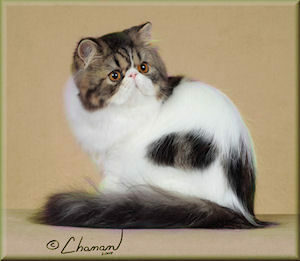 At the Foot of the Rockies Cat Show in Aurora, Colorado the weekend of September 22 and 23, 2007, Gracie completed the requirements for her CFA Championship title at just a little over 8 months of age. 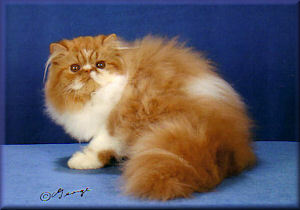 She also was awarded a ribbon for Second Best of Breed/Division over two much older Champion cats. 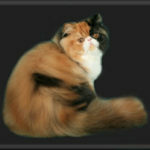 We are very proud of our Gracie. 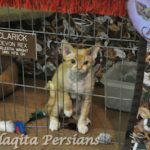 Photo taken by Chanan and used with permission. 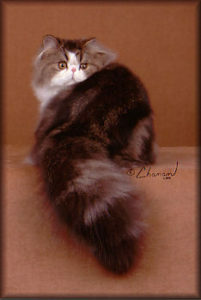 At the Front Range Cat Fanciers' show in Brighton, Colorado the weekend of February 17th, 2007, we first showed Lily in the 5 month old kitten class. 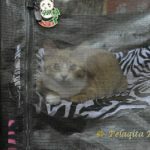 Lily is pictured below in her new cage curtains made especially for her by Susan Fillis of Lark Hill Persians. 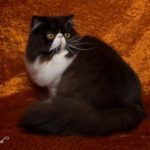 At the Front Range Cat Fanciers' show in Brighton, Colorado on February 18 & 19, 2006, Mystie successfully completed the requirements for a champion title. 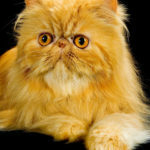 Photo taken by Jim Brown of Pheline Photography and used with permission.